We had an even baker’s dozen at the Skills Clinic in Malibu Creek State Park this month at the Basic Skills Clinic. The weather was perfect! The clinic is always held the first Saturday of the month. You can see the photos in our August photo gallery . GGR Preps for Upcoming Annual Events! We had an uncommonly small class of only 7 on a partly sunny day in Malibu Creek State Park this month at the Basic Skills Clinic. The clinic is always held the first Saturday of the month. You can see the photos in our May photo gallery . The May 2016 edition of CORBA’s monthly newsletter, the eTerraTimes , was published today, May 5. If you don’t get it by email, you can view it online . 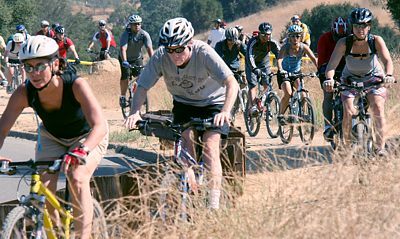 As always, the eTerraTimes has all the latest news for mountain bikers in the Santa Monica Mountains and surrounding areas. This fall IMBA is doing a membership drive. 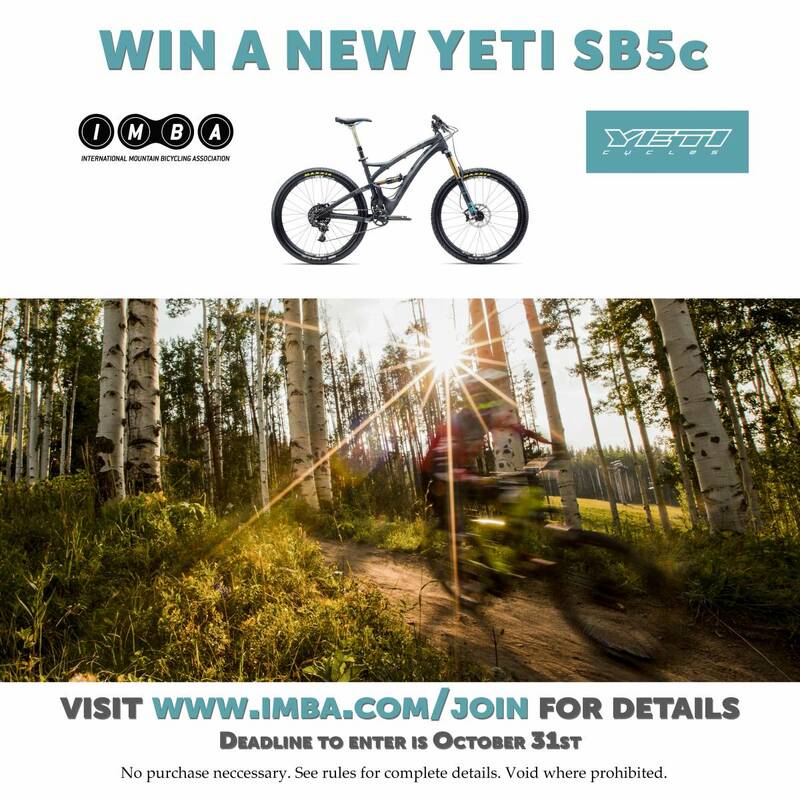 Between now and October 30th, by joining or renewing your membership to CORBA and IMBA, you’ll be eligible for a drawing for a Yeti SB 5c mountain bike, and a year’s supply of nutrition from CLIF Bar including set of Maxxis Tires (27.5 or 29). If you’d rather not support new trails, but want to be eligible, you can sign up for an entry at https://www.imba.com/2016-membership-contest-signup. Women who join or renew before October 30 will also be eligible for a prize from CORBA, to be drawn at our upcoming Rocktober event in Castaic. We have goodies from REI, Ergon, and others. So go ahead and join this month. If you’re membership isn’t expired, an additional year will be added to your membership so there’s nothing to lose. Support CORBA and become a member today! You might end up with a cool new Yeti mountain bike, or other goodies. For CORBA workdays, we provide lunch for participants after we're finished. Please register in advance to help us prepare by knowing how many volunteers to expect. And... If you come out to two or more trailwork days in a year, we'll give you a cool long-sleeved CORBA trail crew shirt - be sure to ask for yours! Children must be over 7-years old to attend, and children under 14 must be constantly and directly supervised by their parent or guardian who brought them. Children under 18 must have their waiver signed by their parent or legal guardian. 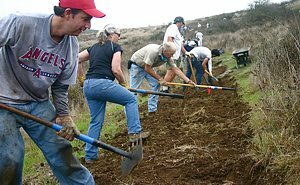 Saturday October 15: Build a new trail in Thousand Oaks during the COSCA Annual Trailwork Day. This year we'll build a new 0.7-mile trail that will lead from Newbury Park down into the Conejo Canyons Open Space (Western Plateau). This will become the pimary way for access, supplanting the steep and hot Edison Road and 'Baxter Road.' On-site registration starts at 7:30 am. 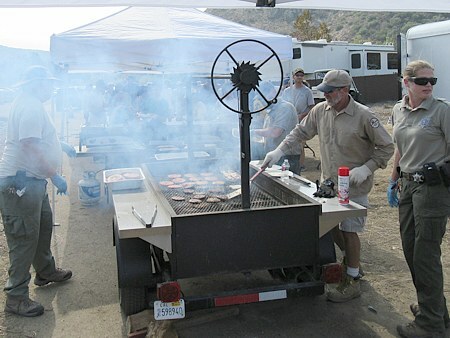 Trailwork is followed at noon by a free barbecue for workers and a prize give-away. Our online details and registration page has all the details. Canyon Trail Sand Fire Trailwork, September 10. About 30 mountain bikers joined 50 or so HandsOn Santa Clarita volunteers to help with Sand Fire cleanup at the Placerita Canyon Nature Center in Placerita Canyon State Park. We split up and built eight debris check dams in drainages that lead into the streambed of Placerita Creek. After a fire, soil and ash denuded of vegetation, can become major debris flows with a relatively small amount of rain. These debris flows do more damage to trails than anything else. The debris check dams will help capture sediment and slow down flows before they cross the trail and enter the canyon. You can see the full report, including two videos, on our Canyon Trail blog report. Saturday October 1st is the next skills clinic.